What inspires me: Air inspires me every day. It’s the most important thing in life and it doesn’t get the respect it deserves. Best advice: Use the garden as your canvas, to tell the story you want to tell. Travel across the skyline of Los Angeles, beyond the glitz of Hollywood, over the ghettos patrolled by hunched-shouldered youths, not far from the shopping strips jammed with fast food outlets where people groan with the weight of their own obesity, and descend into South Central LA. Here sits an unassuming house, amid a street of modest homes. 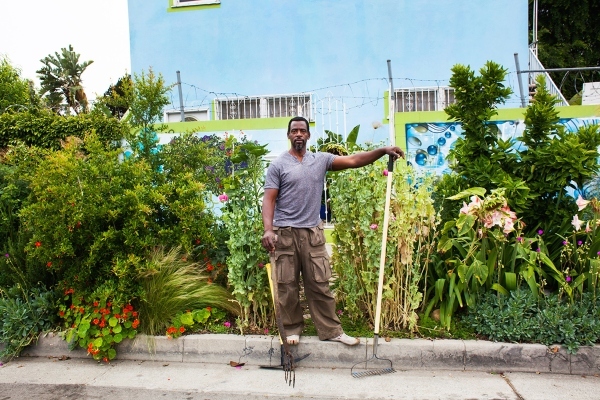 Out the front, tending to the garden on his verge and chatting to his neighbour, is Ron Finley – an artist and fashion designer who has risen to fame as the ‘Gangsta Gardener’. 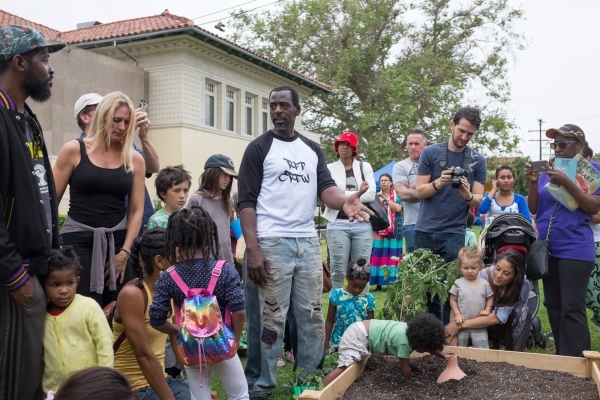 Ron has led a movement in which people across the world are transforming abandoned areas into gardens. With shovel in hand they are turning forgotten blocks into vegetable patches and roadside verges into colourful flower-beds. But this movement is about more than gardens – it’s about bucking the system, empowering people to design life in the way they want it, about helping them to realise they don’t have to do things in the way they’ve always been done. For Ron says drive-through fast food outlets are killing more people than the drive-by shootings that dominate media headlines in his LA home. It’s the preventable diseases caused by poor diets that are bringing down the people of his neighbourhood. Imagine, he thought, if residents could take matters into their own hands. If they could plant their own food on forgotten patches of dirt? But the LA authorities were not so smitten. They demanded he remove the garden, claiming the sidewalk was not his to beautify. Ron refused. They insisted. He ignored them. They issued a warrant for his arrest. Supporters rallied to Ron’s side, gathering 900 signatures on a petition. But it was the media interest that sparked change. Ron’s bid to beautify his verge and bring the community together through gardens grasped the public imagination. The bureaucrats buckled. Ok, they said, but you need to buy a $400 permit. Ron’s stubbornness prevailed and he eventually received permission to continue his garden. But the public standoff led to far more than a pretty verge. For Ron had realised the power of a movement. He began planting gardens – particularly vegetable patches – in unloved pieces of dirt across the neighbourhood. Other people joined in. This was an area where you had to travel half an hour to buy a piece of fresh fruit. No wonder the kids were fat, the adults were sick. Why not surpass the obstacles to healthy living by taking it into your own hands and planting your own food, Ron questioned? Why not help kids understand what real food is? Why not eat food that’s not made up of ingredients so complicated they are near impossible to pronounce? “If kids grow kale, they eat kale, if they grow tomatoes they eat tomatoes,” Ron says. Ron dreamed of a world where everyone planted foods and started sharing their produce – I’ll give you a lettuce in return for my carrots. He dreamed of people taking their health into their own hands, and at the same time saving money, meeting neighbours and forging a sense of community. Ron’s vision spread. Others started to plant veggie patches in median strips, along sidewalks, in vacant blocks. 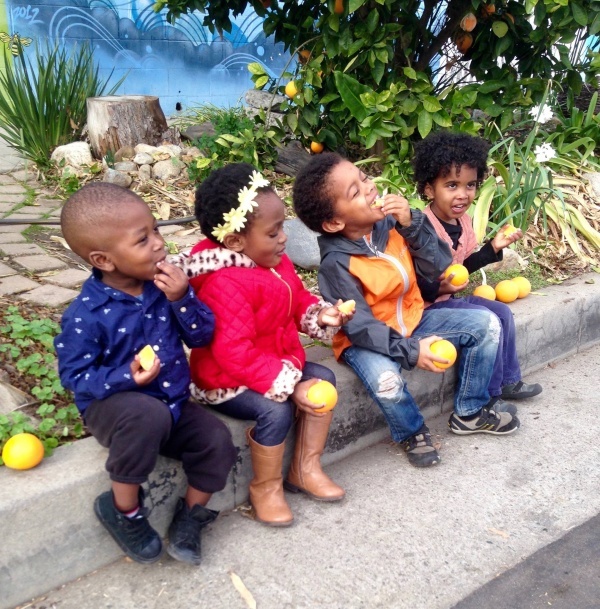 Soon dozens, then hundreds of gardens and veggie patches had sprung up across LA. 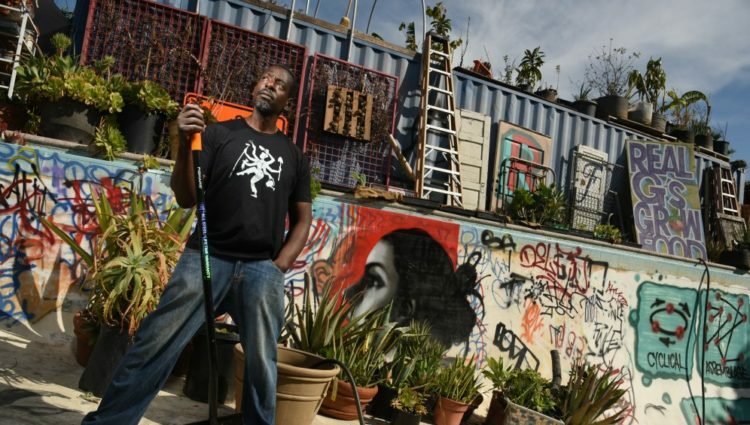 Ron gave a TED Talk on the ‘Gangsta Gardening’ movement and his vision spread still further. Soon people in other American states caught on. Before long people in the UK, in Africa, and Korea were taking part. Watch Ron’s TED talk here.